“Cilla vom Dachbuhlweg”.Through her (the dog) he discovered his love and passion for sports including dogs and therefore joined the SV as well as the GSD-Club in Bürstadt, Germany. 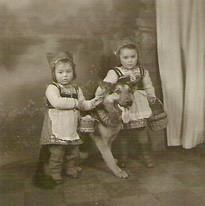 Two years later (1953) he decided to start breeding the GSD and registered the name “vom Bubenlachring”. This name was chosen since the GSD-club was located in a district called Bubenlache. In the same year his dog “Cilla” had her first puppies. At the Club he then met his future wife Christa who was also very involved with GSD’s since her early childhood. 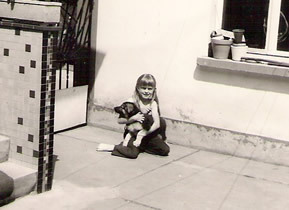 Several years later my father bought a female puppy by the name of “Donna vom Haus Brückmann” and trained her himself successfully. He also presented her at many shows where she received top ratings (V1) and this extra ordinary GSD became his breeding female. During his entire breeding career he achieved a lot of success and got many awards. His most significant with his Dogs “Nadja vom Bubenlachring” und “Quax vom Bubenlachring”. In the meantime I came into the picture although my siblings were. It was me that inherited my fathers love and passion for his hobby. As a result I accompanied him frequently to the training sessions and also looked after / took care of the puppies. Through the years I became my fathers shadow and went with him to all tests and expositions as well as annual Siegershow. From 1998 my father turned most oft the training over to me. After 2006 he more less retired and is now just available for consultation and advice. He therefore passed the title “vom Bubenlachring” on to me. The first litter I’m accomplished in my name is the “K-litter vom Bubenlachring” in the year 2006. I am forever grateful and would like to thank my father for all his encouragement and support.